Apple today introduced the second-generation of AirPods, the company's latest ultra-popular wireless headphones. 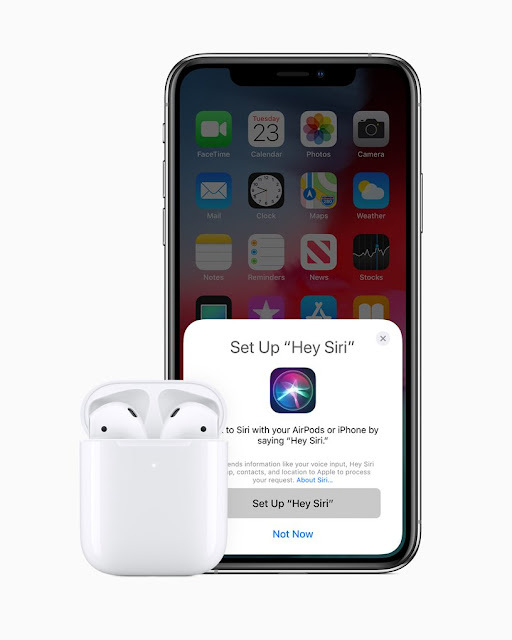 The new AirPods is powered by Apple's H1 Chip that enables "Hey Siri" functionality, while also added up to 50% more of talk time. Perhaps more importantly, it comes in a standard charging case or a wireless charging case for the first time. Furthermore, Apple claims that new AirPods creatures a better audio experience and improved synchronization, so switching between devices while listening to music on iPhone, Apple Watch or iPad is more seamless than ever with two times faster connect times. As for wireless charging, the case itself holds additional charges for more than 24 hours of total listening time, even better, it includes an LED indicator that shows the charging status. In terms of pricing, the new AirPods are now available to order for $159 with a standard charging case and for $199 with a wireless charging case and will be available at Apple Stores and select resellers starting next week. However, Apple is offering the wireless charging case for $79, where you can use it with the original AirPods.